* Kayoko Dan is getting married in June. * She has a border collie mix named Maggie Moo. "She's my accomplice, my sidekick," Dan says. * She competes in triathlons and marathons. "I realized when I went to graduate school that my life was becoming just music. I needed to start doing something to pull me away from music. I didn't want to be a one-dimensional human. So I took up running because it's the cheapest." * Her parents live in Houston and her younger sister lives in Japan. * She hates butterflies and loves cows. * She enjoys dance. Her first professional conducting job was "The Nutcracker." * Her dream pieces to conduct include Beethoven's Ninth Symphony and Mozart's Requiem Mass in D Minor. After a two-year search, the Chattanooga Symphony & Opera has selected a new music director. Kayoko Dan, 33, will succeed Robert Bernhardt as the eighth leader of the CSO. 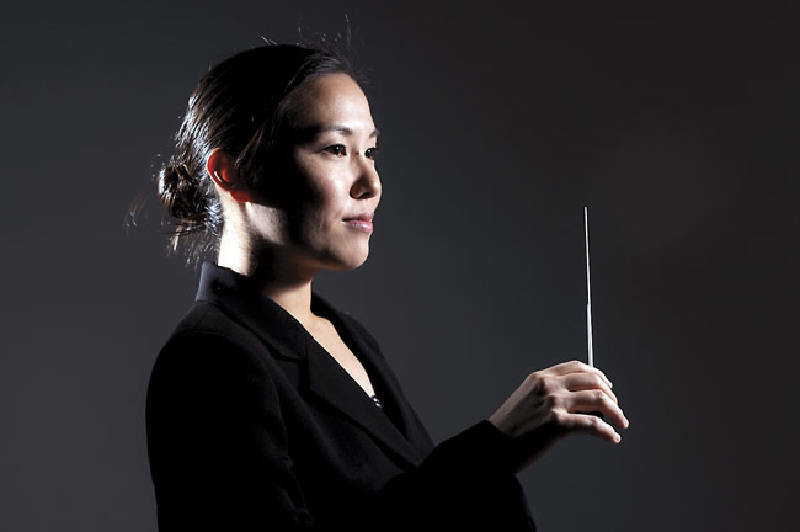 She is the first woman and the youngest person to earn the position of CSO music director. "We think she's a superstar in the making," CSO Executive Director Molly Sasse said. Dan is currently the director of the Central Kentucky Youth Orchestra in Lexington. The position in Chattanooga will be her first leading a full orchestra. Bernhardt, who held the position for 19 years, will continue as pops conductor and will become the CSO's first music director emeritus. An 11-member committee, including four musicians, made the selection. More than 250 applications for the CSO position from across the United States were sent to Henry Fogel, a Chicago-based orchestral consultant who narrowed the field to 45. The four musicians on the search committee watched DVDs of all the semifinalists and took their selections to the group. Over two years, the top nine of 12 finalists each led the CSO as a guest conductor. "There was a great chemistry we had together," Dan said in a recent interview. "It felt good, being on the podium here and working with them." Katie Wilson, the CSO's marketing director, said CSO musicians were involved heavily in the decision to offer the position to Dan. "We had to know that they could work with the new director," she said. Spencer McCallie, who served as committee chairman, said each meeting would begin with the musicians sharing the reactions of their colleagues to each candidate. "In the end, we had had nine very good visits," McCallie said. "The difficulty in making the decision was that there were so many positive things to talk about. ... But we realized everybody was leaning the same way. I've never seen a stronger consensus." Principal bassoonist Gordon James, who served on the selection committee, said all the guest conductors except Dan received at least one negative review from the orchestra. "I think the thing that made her stand out in the end was her warmth and sincerity in combination with a very easy style of conducting," he said. "We were looking for somebody who was going to have a sense of programming music, something people would want to support and attend. We feel like under our new director we are going to be able to maintain the highest [standard of] excellence. We're very excited about that." Born in Japan, Dan moved to Houston with her family at age 8. She said music was how she found her place as a child. "Singing in a choir or playing the piano was a way of communicating with people," she said. "I felt like I was part of a community in the classroom. When I couldn't speak [English], I felt like I was just an outsider, but with music I was able to belong." Sasse and Wilson said they hope Dan's appointment will help to build a new generation of CSO patrons. "Youth is a big part of why the search committee was attracted to her," Sasse said. "I think the musicians felt like she was a consummate musician. I think they feel like she can move the orchestra ahead artistically." But Dan is not focused on her youth, except where it allows for potential progress. "Time will take care of that," she rationalized. "The good thing is, I'm still growing." Q: How did you find the experience of working with the CSO? A: From the first rehearsal, the musicians were so responsive to what I did and what I asked them to do. They were very patient with me. Sometimes I'll conduct an orchestra and I feel like I'm fighting against the musicians. With the CSO, there was a really huge bond we were able to establish right away. Q: How do you plan to lead the CSO in conversation with the community? A: The conductor is the only person on stage who isn't making any sound. So I have to have the orchestra for me to be able to communicate with the audience. I'm just the one standing there and leading them, but really it's the orchestra that's making the beautiful sound. Together, we're able to communicate with the audience. Q: Do you have any philosophies on conducting? A: My number one goal is to make sure we sound good. I don't really practice in front of a mirror. I don't want to look choreographed. I'm there to lead them and I'm there to help make sure we sound good together. I don't want to get in the way. Q: What are some of your goals here? In what direction would you like to take the CSO? A: The artistic growth is number one. I'd like to introduce some newer works. There are some amazing works that have been done recently that the audience in Chattanooga deserves to hear. [Also] bringing in a lot of younger, up-and-coming soloists that definitely will make it big later on in their lives. I'd like to commission some works in the future. I know some really talented young composers who are itching to write pieces. I want to make sure the CSO is the leading organization for performing arts in this community. Q: What are the benefits and challenges of being the first female music director in CSO history? A: I hope musicians don't see me as a woman, and I hope the community doesn't see me as a woman. I hope they see me as a conductor. Musicians can sense a good or bad conductor right away. It doesn't matter what gender you are. Q: You're an advocate of music education. Do you plan to continue your efforts in Chattanooga? A: Absolutely. The children are the future audience and patrons, and they might actually be playing in our orchestra in a decade or two. We have to make sure they are exposed to music and they come to concerts. They should know it's accessible to them as well. Q: Are you at all nervous about your new position here? A: No, I'm just excited right now. I'm sure I will be nervous once it settles. I try not to think about it. I'm a realist, but at the same time I'm more hopelessly optimistic in a way. I think things will work out. There's no sense worrying about things that haven't happened yet. Q: What will your role as music director entail? A: We have to make sure that the concerts sound good and that we're providing programs that are educational, enthusiastic, energetic, entertaining and all that good stuff, to the audience, so they're excited about coming to the concerts and they're inspired. Number two is that as the music director I have to be the ambassador of arts and music in the community.